WASHINGTON — The White House says President Donald Trump's Mideast negotiating team will visit the region next week as it finalizes its as-yet unveiled Israeli-Palestinian peace plan and will hold talks on deteriorating conditions in the Gaza Strip. The trip comes as officials say the Trump administration is near completion of the plan with an eye on a possible release this summer. The National Security Council said Wednesday that Trump's son-in-law and senior adviser Jared Kushner and special representative for international negotiations Jason Greenblatt would travel to Israel, Egypt and Saudi Arabia. It said they would discuss "the next stages of the peace effort" and get ideas from regional leaders about "remaining questions the White House peace team has." No stop in the Palestinian territories is planned, although the NSC said the itinerary may be expanded. However, the prospect of Palestinian interest in the peace proposal appears dim. Peace talks have been frozen since 2014, and Palestinian leaders have been boycotting high-level talks with U.S. officials for months, complaining that the Trump is biased toward Israel. U.S. officials had said in late May that the administration was aiming to release the peace plan shortly after the Muslim holy month of Ramadan ends later this week. However, that timeline appears to have been pushed back to at least August, the same officials said Wednesday. 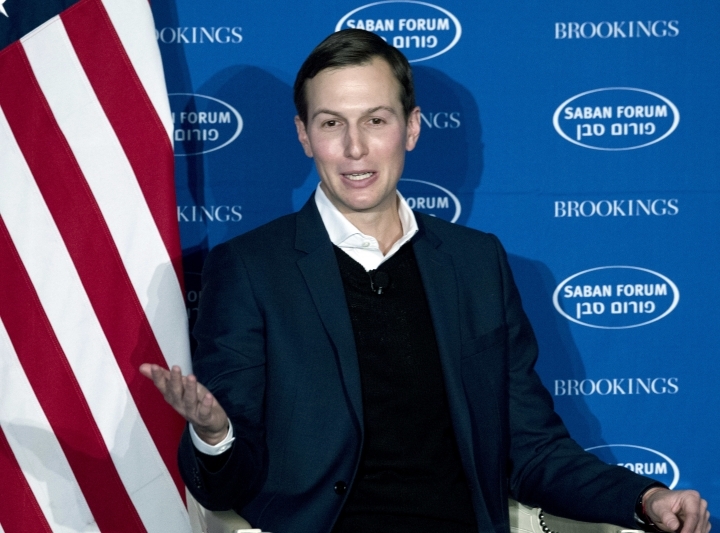 The Kushner, Greenblatt trip comes at a particularly fraught time in U.S.-Palestinian relations, which have plummeted since Trump recognized Jerusalem as Israel's capital and moved the U.S. embassy to the holy city from Tel Aviv. On Sunday, Greenblatt lashed out at the Palestinians' veteran chief negotiator, saying his "false claims" and angry rhetoric haven't brought peace closer. The negotiator, Saeb Erekat, had earlier accused American officials of acting as "spokespeople" for Israel and criticized the U.S. for moving the embassy. In an op-ed published in Israel's Haaretz newspaper, Greenblatt wrote that Erekat's claims "were in many respects simply inaccurate" and suggested it was time for him to step down. "Dr. Erekat — we have heard your voice for decades and it has not achieved anything close to Palestinian aspirations or anything close to a comprehensive peace agreement. Other Palestinian perspectives might help us finally achieve a comprehensive peace agreement where Palestinian and Israeli lives can be better," Greenblatt wrote. Erekat had condemned the U.S. for the embassy move noting it occurred amid violence along the Gaza border, just 45 miles (70 miles) away. On the day of its opening in Jerusalem, an estimated 59 Palestinians were killed in Gaza at a mass rally led by the Islamic militant group Hamas, which rules the territory. He said the contrast between the two events that day "aptly demonstrates the complete U.S. and Israeli denial of the Palestinian history of dispossession." "For far too long, the United States has turned a deaf ear to such words, but ignoring hateful and false words has not brought peace and it will never bring peace," he wrote. "While some protesters were peaceful, many were quite violent. In fact, by Hamas' own admission, more than 80 percent of those killed were Hamas operatives."